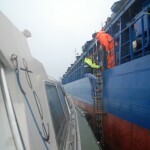 Leader in handling of agri products in bulk intended to animal feeding, in conventional commodities, the AGENCE MARITIME LORIENTAISE is also a specialist in the handling of heavy and fragile parcels (return of offshore races, electric transformers, piles, etc …). The AGENCE MARITIME LORIENTAISE has more than 150,000 tons of warehouse capacity, 50,000 square meters of specialized and dedicated surface area. It ensures optimal preservation and traceability of goods, offers bagging services and manages the preparation of orders and shipments. 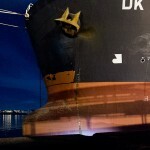 The shipping agency department ensures a permanent relationship between the shipowner, the shipper, the vessel and port actors. 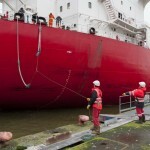 A competent, efficient and available 24-hour team performs the nautical and commercial preparation of the call, monitoring of loading and unloading operations and assists the vessel and the crew. National and international, of all products, all destinations, all origins, by road, rail, sea or air. OMA Logistic Solutions offers to its customers advice in international Logistics, Customs, setting up of domiciled customs procedures, for companies or individuals, as well as exchange of goods declarations (D.E.B.). 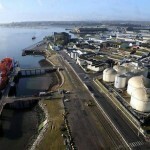 Dépôt Pétrolier de Lorient / DPL is a CPP storage company acting as operator on behalf of its shareholders : Total, Bolloré, Picoty, and Scaped. 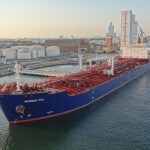 Clean Petroleum products and FAME supplies are provided either by coastal navigation tankers loaded at Donges refinery or importations from EEC or non EEC ports. 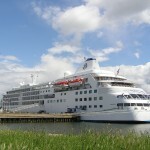 Ships usually carry cargoes between 2 500 and 24 000 Mts. Customer catchment area of DPL are mostly the French departments (areas) of Morbihan, Finistère, Ile et Vilaine and Côtes d’Armor. 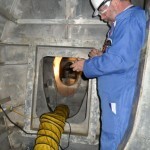 Management is ran by a 15 people team, including a general manager, one operations manager, one for works too, and 12 operators. 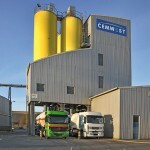 CEMWEST is a cement terminal, with an activity of distribution of bulk cement and production of bags. 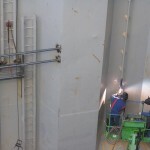 SLTIM is a yard specialized in ship repairs, industrial & naval pipings. 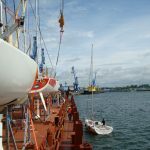 Workers with welding licence “hull” (steel, alu) and “piping” (steel, stainless steel, cupro nickel, alu), are attending various types of vessels such as cargo ships, dredgers, small ropax, fishing boats, barges, sailing yachts and pleasure crafts.